Everybody wants to sell preconfigured virtualized servers with integrated management. Otherwise known a private infrastructure cloud. Now Oracle does too, only it calls them Oracle Optimized Solution for Enterprise Cloud Infrastructure. Presumably, this is not meant to be abbreviated to OOSFECI. At the Cloud Expo 2011 in New York this week, Oracle said it had packed up its Sun Blade 6000 chassis and its virtualized network expansion modules for peripheral expansion with its Sun Blade X6270 M2 blade servers for a private cloud foundation. The Sun blades sport two processor sockets and are equipped with Intel's four-core and six-core Xeon 5600 processors; the blades have 18 DDR memory slots and room for four 2.5-inch drives. The Oracle private cloud also includes Sun X6275 M2 blade servers, which pack two Xeon 5600-based server nodes into a single blade, offering up to 24 cores per blade. Oracle is using the version of this blade server with 10 Gigabit Ethernet modules (they are Mellanox ConnectX-2 adapters) hooking into the back of the Sun Blade 6000 chassis. Oracle did not provide the precise configuration of blades for the Enterprise Cloud Infrastructure, but it did explain in a whitepaper that the Sun Blade 6000 chassis holds ten single-node or dual-node blade servers and that the setup was designed to scale from 2 to 32 nodes in a single Oracle VM server pool and that the system could scale further across multiple server pools. The network expansion module in the blade chassis has 10 downlinks (one per blade) and 14 uplinks, which are used to link to top-of-rack switches as well as ZFS storage appliances where the blades actually store their virtual machines. Oracle is letting customers choose from a variety of Sun ZFS Storage arrays (models 7120, 7320, 7420m, and 7720) for their private clouds. The storage is linked to the blades using the NFS protocol riding atop 10GE links. Oracle recommends that for VMs running application or middleware programs, you need a minimum of 4GB of memory and two virtual CPUs; for database partitions, you need to boost the memory to 16GB at a minimum and allocate four virtual CPUs. The database in question is, of course, one of Oracle's own. Oracle also recommends that customers put database VMs in mirrored storage pools (which helps with I/O performance) but says that RAID-Z2 data protection is best for the VM repository, middleware components, and application libraries, which incidentally should all be put into separate storage pools on the ZFS Storage arrays. On the software side, the Oracle x64 blade cloud runs Oracle VM Server 2.2.2, the software giant's interpretation of the open source Xen hypervisor, on each blade. Oracle VM Manager 2.2, which managed the virtual machines inside of a server pool, runs within a Xen VM and is itself clustered for high availability. This manager controls live migration of VMs as they flit around the cloud as well as stopping and restarting of VMs as needed, and the high availability software does auto-restart on failed VMs and also performs load balancing as new VMs are introduced into the private cloud. Oracle also tosses in a number of VM templates for its software stacks. Solaris 10 and Oracle Linux 5 are supported operating systems running atop these virtual machines. 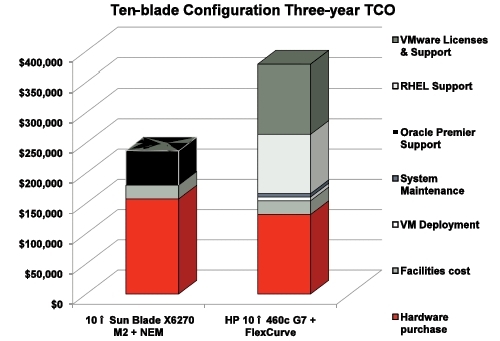 In this comparison, Oracle is pitting a Sun Blade 6000 chassis with ten of the X6270 blades against a Hewlett-Packard c7000 chassis with ten of its BL460c G7 two-socket Xeon 5600 blade servers. Oracle says the comparison includes the cost of the networking and chassis. On the Oracle side, the comparison has Oracle Linux running atop Oracle VM, and on the HP side, Oracle is adding VMware vSphere licenses (what SKU is unknown, and details were not available as El Reg went to press) for server virtualization and Red Hat Enterprise Linux support licenses for the operating systems. This chart goes a long way to explaining why Oracle bought Sun and thinks it can get away with being a complete stack vendor. Oracle openly admits that it charges a premium for the hardware – it looks like about 20 per cent. But over the course of three years, Oracle says its premier support contracts covering the servers, hypervisors, and operating systems will be significantly less costly than the license and support contracts for the HP iron and VMware and Red Hat software. To our eye in this chart, over the three years it looks like the Oracle "cloud" costs $85,000, versus around $250,000 for the HP-Red Hat-VMware "cloud".